all rolled into one simple and profound stick-anywhere disc!!! The Golden Fire Disc.... a simple and powerful alternative to the traditional Meter Ring. This water-proof device will stick to your Fuse Panel, or meter housing, as it has the same backing as our Cell Tabs. or electromagnetic energies at their source!!! Make home feel like Home!!! With all Tensor tools, we are not trying to block energies, rather transforming energy fields and frequencies. NEW!!! Golden Fire Disk Outlet Plug!! The Golden Fire Disc is attached to a "safety plug", which plugs into any standard US outlet. * The plastic prongs simply hold the disc close enough to the electrical field for the energetic connection to be made. Perfect for travelers or those who want the security of having their outlets transformed into beneficial energy field emitters! We have seen professional Dowsers put these onto electrical transformers boxes in a neighborhood, which changes the energy from negative thousands to positive hundreds... at the transformer as well as in EVERY ELECTRICAL PANEL connected to the transformer!! 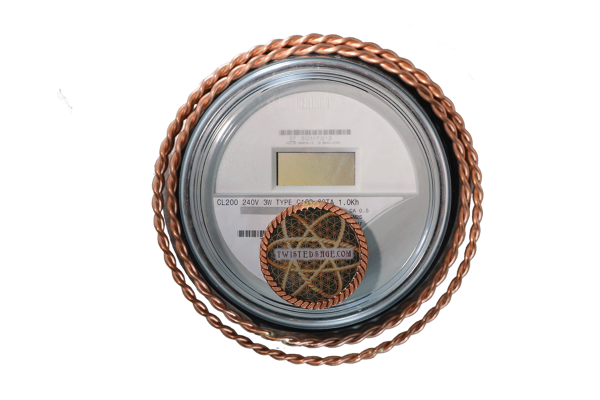 The Golden Fire Disc is not needed on the Meter itself, as the transformation occurs no matter where on your electrical system you put the Disc. Even Smart Meter transmissions are cleared with the Disc placed inside the home on the Electrical Panel. Cleaning, clearing, and creating healing space. as well as the frequencies and properties of Unconditional Love, which flow through the electrical wiring of the building…enveloping all occupants in a transformative, healing, loving, energy. Creates a Sacred Space throughout your entire home!!! I use mine as a Cell Phone Tab!!! ....though our Cell Tabs are powerful enough for all your cellular transformation needs, it can be used on any electrical device or household electrical system. * For other country style plugs, simply cut one of the plastic tabs off, and insert into the electrical plug. The Safety Plug is a standard plug cover used for protecting infants from electrical outlets. My eyes are very dry, especially when I'm on my computer. I have fixed one Golden Fire Disc to my computer and another to my Kindle device and my eyes are really much better now. Thank you Twistedsage! In early August, I bought a 2″ Golden Fire Disc to use on the window at my office. The building across the street from ours has at least a dozen microwave towers on top, facing our building. I’ve been concerned about the effects of these microwave emitters for some time now. After speaking with Brian about this problem, he suggested that this product could help. Once it arrived, I posted it to my window and could tell an immediate difference as the energy shifted to a much calmer, milder flow. I’ve now had the disc for about 3 weels, and wanted to give it some time before reviewing the product to see whether the positive effects would be maintained. I’m happy to report that the positive energy flow continues, and every part of our building feels more at ease. I no longer experience the headaches and tension that I did before applying the disc to the window facing these microwave towers. Many thanks to Brian and his team for creating and making available these powerful tools for shifting energies. I highly recommend them for anyonw who needs to make such a change in the way energy flows around them. In early August, I bought a 2" Golden Fire Disc to use on the window at my office. The building across the street from ours has at least a dozen microwave towers on top, facing our building. I've been concerned about the effects of these microwave emitters for some time now. After speaking with Brian about this problem, he suggested that this product could help. Once it arrived, I posted it to my window and could tell an immediate difference as the energy shifted to a much calmer, milder flow. I've now had the disc for about 3 weels, and wanted to give it some time before reviewing the product to see whether the positive effects would be maintained. I'm happy to report that the positive energy flow continues, and every part of our building feels more at ease. I no longer experience the headaches and tension that I did before applying the disc to the window facing these microwave towers. Many thanks to Brian and his team for creating and making available these powerful tools for shifting energies. I highly recommend them for anyonw who needs to make such a change in the way energy flows around them.